Another trip to Atlanta, what could possibly go wrong? Zack Wheeler and the anemic Met offense squared off against Mike Foltynewicz and the best offense in the National League to start a two-game set. Both starters worked around a first inning baserunner to settle into an early groove. Foltynewicz hit Michael Conforto leading off the first, then retired the next 12 Mets in order. Wheeler worked around a one out double from Dansby Swanson, then looked dominant for the next two innings against a good Braves’ lineup. As you could have guessed from the recent quality of Mets games, such a performance would not last. Wheeler waked Freddie Freeman to lead off the fourth, then gave up two soft singles to load the bases with no outs (the second should definitely have been caught, but Conforto froze on contact). Wheeler almost escaped, inducing a 1-2-5 double play, but Ender Inciarte managed a third soft hit single of the inning to put the Braves ahead 1-0. The Mets had a chance to get that run right back, putting two men on with one out in the top of the fifth. Foltynewicz navigated Amed Rosario and Wheeler with ease, however, to end the threat. Oddly, Foltynewicz was lifted after the fifth, despite no apparent injury either while pitching or swinging the bat. That brought Jesse Biddle into the game and opened the door for the Mets once again. 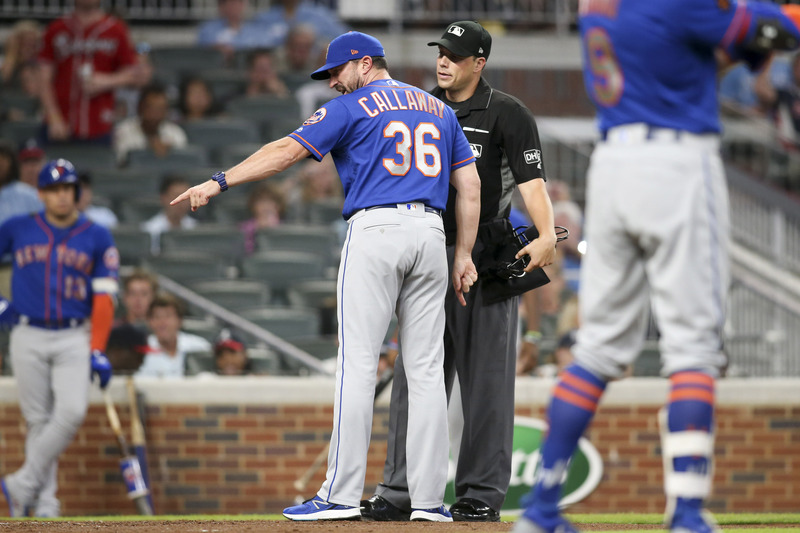 Two walks and an error – as well as an ejection for Mickey Callaway when Brandon Nimmo was called for leaning into a pitch – loaded the bases with one out for Jay Bruce, who finally came through after two months of futility with an two RBI ground-rule double. There was a chance for more, but Johan Camargo made a fantastic, heads-up play on a ground ball from Devin Mesoraco. Camargo made a diving stop, dove across the bag to tag Asdrubal Cabrera out, then threw to first to complete one of the better double plays you’ll see and end the threat. Freddie Freeman made sure the lead was short lived, depositing the first pitch Wheeler threw in the sixth inning into the right field stands. It wasn’t a bad pitch, a breaking ball on the black inside, but Freeman is one of the best hitters in the game for a reason. The Braves followed that with a single, fielder’s choice, then another single. Tyler Flowers tried to go first-to-third on the second single, but was thrown out by Bruce for the second out of the game. Camargo advanced to second on the throw, and Ender Inciarte hit his second RBI bloop single of the game to put the Braves back in front 3-2. The game totally went off the rails from that point. Cabrera dropped a throw at second that would have caught Inciarte single, and Wheeler followed by walking the next two batters to load the bases. Paul Sewald replaced him to face Ozzie Albies, who busted out of his slump with a grand slam to put the Braves up 7-2. A fly ball botched by Bruce led to another run for the Braves, but there wasn’t much action for the rest of the game otherwise. The Mets quietly accepted their 8-2 loss, managing only three hits as their record falls to 28-35. Jacob deGrom starts today in a noon game. At this point, the only logical conclusion is that the Mets will simply never learn. Playing Cabrera on one leg is ridiculous and borderline negligent. Multiple times throughout the broadcast, Gary and Ron noted that Cabrera needed to play closer to the bag on defense because he can’t run. It’s truly the definition of insanity to keep playing guys through minor injuries, then being befuddled when minor issues grow into long-term, chronic issues that keep significant pieces off the field for long stretches of time. Bruce also fits into this bucket. Twice during the game, Bruce made plays on relatively routine fly balls that were lauded by the booth because of how hard he made them look. Bruce simply cannot move, and it turns every play in right field into an adventure. Nick Markakis’ fly ball late in the game that clanged off of Bruce’s glove after he looked incredibly uncomfortable going back on the ball is a play that every major league quality outfielder should make. Bruce is not that. Sandy Alderson had a long press conference yesterday, during which he said a number of ludicrous things. Jose Reyes is apparently still a viable player for the team because they don’t have any options behind him. Of course, they have between three and five superior options, but this front office clearly isn’t very in touch with reality. Alderson also hinted as possible promotions for Jeff McNeil and Peter Alonso to Triple-A Las Vegas. Never mind that both should have been in the majors three weeks ago. Elsewhere, Wilmer Flores appeared in a rehab game for the St. Lucie Mets and went 1-for-3 with a double.